Belly dance is one of the world’s most ancient dance styles. Combining rich history, grace, fluidity, musicality and self expression. It is a low impact form of exercise perfect for adult women wanting to increase their energy level, stabilize and gain better control of their bodies. We offer classes for all dance levels in MT DRUITT / ST MARY’S / NORTHMEAD / LEICHHARDT. If our class times do not suit your schedule, you can always book in for a in studio / in home or work place private tuition or Skype lessons. Cost: $120 for 8 weeks / $60 for 4 weeks / $18 casual. FREE TRIAL CLASS every term! Private Tuition / Skype Lesson available by appointment only. 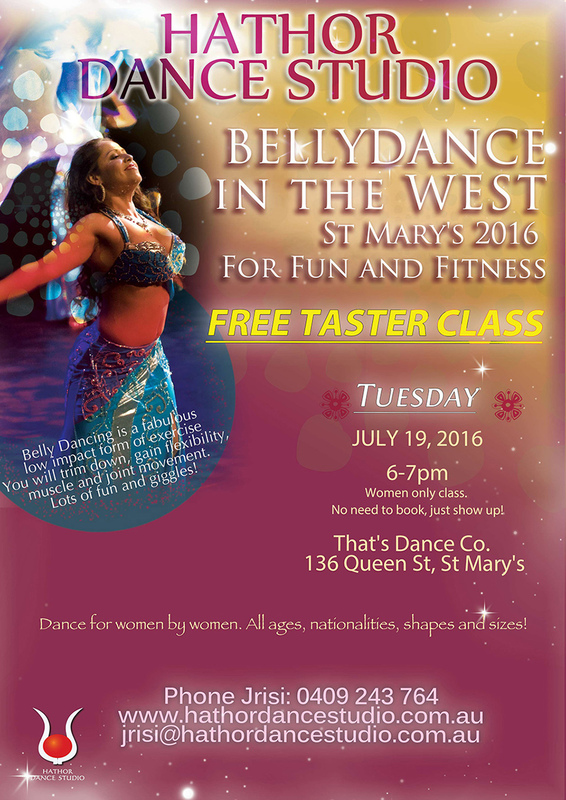 This class is suitable for people without prior knowledge of Oriental Bellydance. Basics of the dance are taught and movements are reinforced throughout the course. You will learn: posture/alignment, basic hip work, shoulder shimmy and hip shimmy, basic figure 8’s, body/head isolation, hand/arm placement. This class is suitable for people with two terms of Beginners course completed. Focus of class will be on reinforcing technique and layering with shimmy. Transitions between static movements and travelling movements are taught. Appreciation of Arabic rhythms is of focus in this class. Choreography is taught, veil work. This class is a mixture of techniques of Beginner and Beyond Beginner Levels with the focus on clarity of movement, correct alingment, hip dexterity, music appreciation, understading Arabic music patterns and awareness of space. Use of props such as veil and finger cymbals. This is a great class in conjunction with Intermediate or Beginners. This class is suitable for people with at least 2 years solid training. In this class we focus on appreciation of Arabic music from classical to folkloric. Dancing with props such as Stick, finger cymbals and veil are taught. Travelling steps, footwork, levels, dynamics and performance skills are taught. Choreography learned in this class is usually for performance. Graduates of this class are considered for group presentations and to join our student troupe The Hathor Dance Ensemble I or II. This class focuses on entire presentation of a dancer, posture/alingment, how to use space effectively, fast travelling sequences, footwork and patterns, basic performance skills.A good class to do in conjunction with Intermediate and Advanced/Performance. This class is suitable for dancers with at least 3 years studies, working teachers and teachers in training. Graduates of this class are present group choreographies at our regular “Haflas on the Side” with the Hathor Dance Ensemble II cast. This class is suitable for people with at least 4 years solid training or for people who are looking to enter the professional dance/teaching arena. Advanced technique in Egyptian dance is taught, concentrating on various techniques from leading world master teachers and Jrisi’s own technique. Props taught such as stick, finger cymbals, sword, shamadan and double veil. Choreography taught is for performance. Graduates of this class are considered for professional work opportunities and are invited to audition for our professional dance company the Hathor Dance Theatre. Present members of this class are currently working around the Sydney Arabic restaurants and nightclubs and also teach at several community colleges.